Not to be confused with Maurie Gibb. Maurice Ernest Gibb CBE (/ˈmɒrɪs/; 22 December 1949 – 12 January 2003) was a British musician, singer, songwriter, and record producer, who achieved fame as a member of the pop group Bee Gees. Although his brothers Barry and Robin Gibb were the group's main lead singers, most of their albums included at least one or two compositions by Maurice, including "Lay It on Me", "Country Woman", and "On Time". The Bee Gees were one of the most successful rock-pop groups ever. Gibb's role in the group focused on melody and arrangements, providing backing vocal harmony and playing a variety of instruments. Born on the Isle of Man, Gibb started his music career in 1955 in Manchester, England, joining the skiffle-rock and roll group the Rattlesnakes, which later evolved into the Bee Gees in 1958 when they moved to Australia. They returned to England, where they achieved worldwide fame. In 2002, the Bee Gees were appointed as CBEs for their "contribution to music". Following his death in 2003, Gibb's son collected his award at Buckingham Palace in 2004. Gibb's earliest musical influences included the Everly Brothers, Cliff Richard, and Paul Anka; the Mills Brothers and the Beatles were significant later influences. By 1964 he began his career as an instrumentalist, playing guitar on "Claustrophobia". After the group's break-up in 1969, Gibb released his first solo single, "Railroad", but his first solo album, The Loner, has never been released. Maurice Ernest Gibb was born in Douglas, Isle of Man, on 22 December 1949, the son of Hugh Gibb, a drummer, and his wife Barbara (née Pass). He was the fraternal twin of Robin Gibb, and was the younger of the two by 35 minutes. At that time, he had one sister, Lesley, and one additional brother, Barry (another brother, Andy, would be born in 1958). In January 1955, the Gibbs moved back to Manchester, England. Around 1955, Gibb and his brothers were heard harmonising by their parents. Also in 1955, he started his music career when he joined the skiffle/rock and roll group the Rattlesnakes with his brothers and two friends, Paul Frost and Kenny Horrocks, who were their neighbours. The group's first major appearance was on 28 December 1957 when they performed at a local Gaumont cinema where children were invited to sing between films. They had planned to sing along to a 78 rpm record which Lesley had just been given as a Christmas present, but on the way Gibb and his brother Robin dropped and broke it, so they sang live. The audience were pleased by their singing, which may have been the song "Wake Up Little Susie" by the Everly Brothers. When he was 8 years old, Gibb emigrated to Redcliffe, in Queensland, Australia, with his family. Shortly after, he and his brothers formed the Bee Gees. By January 1963 the Gibbs moved to Sydney. The group's first single was "The Battle of the Blue and the Grey" but it failed to chart. Around 1963, the Gibb brothers worked with Judy Stone, Johnny Devlin and Jimmy Hannan. By 1964, Gibb made his first appearance as an instrumentalist on the beat-influenced "Claustrophobia". Also in 1964, the Gibb brothers worked with Johnny Devlin and Trevor Gordon. Around 1965, the Gibb brothers worked with Trevor Gordon, Michelle Rae and Noeleen Batley. In 1966 the three Gibb brothers wrote their first song, "The Storm". Also in 1966, Gibb began his career as the lead guitarist and bassist for the band; around the same time, he recorded his first solo composition, "All by Myself", on which he also played guitar. Around 1966, the Gibb brothers worked with Bip Addison, Sandy Summers, Anne Shelton, Vince Maloney, April Bryon, MPD Ltd, Ray Brown and the Whispers, Ronnie Burns, Lori Balmer, Marty Rhone, Vyt, Python Lee Jackson, Dennis Knight, Barrington Davis, Jenene and Jon Blanchfield. Their second album, Spicks and Specks (1966), included "Where Are You", Gibb's first solo writing credit to be released. "Maurice is closer to my attitudes and ideas. He has the same kind of humour as I have. We have other common interests like playing chess. He's the kind of guy who will come over and give you a hand washing the car". In March 1967 the Gibb brothers worked with Billy J. Kramer recording "Town of Tuxley Toymaker, Part 1". Around the same time, Colin Petersen and Vince Melouney joined the Bee Gees. In the middle of 1967 Bee Gees' 1st was released. The album was praised by the critics who compared it to the Beatles' Sgt. Pepper's Lonely Hearts Club Band which was released weeks earlier. AllMusic's Bruce Eder wrote that Gibb's Mellotron on "Every Christian Lion Hearted Man Will Show You" 'was close in the spirit of the Moody Blues and was opened by a Gregorian chant.' The band's first number 1 single in the UK, "Massachusetts" was released in September 1967. In early 1968, the Horizontal was released. In August 1968 the Marbles released their first and only successful hit "Only One Woman" a song co-written by Gibb. In the middle of 1968, the band's third international LP Idea included the song "Kitty Can", which features Gibb's high harmony vocal, with Barry Gibb singing low harmony. In early 1969, they released Odessa, which features Gibb's solo vocals on "Suddenly" and "I Laugh in Your Face". On 19 March 1969, the same day that Robin Gibb announced his plans as a solo artist, Gibb and his bandmates recorded and later released "Tomorrow Tomorrow". Maurice and Barry alone comprised the Bee Gees on the 1969 album Cucumber Castle during Robin's absence as a soloist. They sang the hit "Don't Forget to Remember" (which reached number two on the UK chart while Robin's first solo single, "Saved by the Bell", also reached number two) and follow up singles; "IOIO" and "Tomorrow, Tomorrow" with Barry taking lead and Maurice providing harmony vocals, but the duo version of the group enjoyed dwindling success. A supergroup in 1969 called the Fut was formed at a Tin Tin session and they recorded "Have You Heard the Word" while Gibb was still a Bee Gee, and released later as a single, the band consisting of Gibb on vocals/bass/guitar, Steve Kipner and Steve Groves on vocals with Billy Lawrie also providing background vocals. "Have You Heard the Word" features Gibb impersonating John Lennon by singing the song, and the Beatles fans thought that it was the lost Beatles song which was not released. In 1985, Yoko Ono attempted to register the song as Lennon's composition. On 1 December 1969, Maurice and brother Barry announced to the world that the Bee Gees had broken up. The Bee Gees reunited on 21 August 1970. Maurice later began taking a few lead vocals on a Bee Gees tracks in the 70s such as "Lay It on Me", "Country Woman", "On Time" and "You Know It's For You". In 1981, he recorded some instrumental tracks for his unreleased instrumental album Strings and Things, including "Image of Samantha", which seems refer to his daughter Samantha. In 1982, Gibb appeared at the San Remo Festival and performed "Wildflower", a Bee Gees' song on which he provided lead vocals from Living Eyes. In 1983, Gibb re-recorded "On Time" at the same time as "Hold Her in Your Hand". By February 1984, he collaborated with arranger Jimmie Haskell for the film soundtrack of A Breed Apart, recorded at Gold Star Studios in Los Angeles. By March, he recorded "Miami, A Musical Score", this song was later used for a promotional film in Miami. His second single "Hold Her in Your Hand" was only issued in UK, Australia and South Africa. In September 1986, the Bee Gees began writing and recording songs for their upcoming album ESP. on which Maurice took lead vocal on the song "Overnight". Gibb composed and recorded the instrumental "The Supernaturals" in July 1985, it was later dubbed on the film of the same name, he also appeared on the film doing a cameo appearance. On 24 April 2001, The Bee Gees released their 23rd and final studio album, This Is Where I Came In, which included his compositions, "Walking on Air" and "Man in the Middle". DJ Paul Gambaccini said: "Maurice was the talented multi-instrumentalist, I mean here is a guy who played keyboards, guitar, bass and percussion." From 1967 to 1979, he played bass guitar both studio and live. 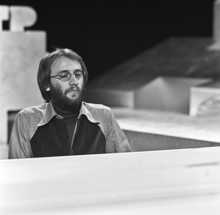 During live performances of the group, an additional musician took the bass part when Gibb switched to piano. During the period from 1975 to 1979 he primarily played bass, creating distinctive syncopated funk bass lines which provided the foundation for the band's driving disco sound. Gibb played Mellotron on several Bee Gees songs, most notably "Every Christian Lion Hearted Man Will Show You" and "Kilburn Towers" The piano on songs like "Words", "First of May" and "Lonely Days" is Gibb's. He played the Moog synthesizer on the song "Sweet Song of Summer" (1972). Beginning in 1987, he generally played keyboards during most of the songs in the group's concert performances, but still played bass or guitar occasionally. Gibb debuted his career as an instrumentalist in 1964 on "Claustrophobia". Also he occasionally played lead guitar (including using the acoustic guitar given to him by John Lennon, which he used on "This Is Where I Came In", 2001). In the reunited Bee Gees from 1987 onward, Gibb was the group's resident expert on all technical phases of recording and co-ordinated musicians and engineers to create much of the group's sound. He also contributed lead guitar on the Bee Gees' recordings in 1966. His composition on which he played lead guitar was "Country Woman" which was the B-side for the group's hit, "How Can You Mend a Broken Heart", as well as some songs on 2 Years On including "Back Home", "Lay It on Me" and "Every Second, Every Minute". On his guitar work on "Back Home", Bruce Eder of AllMusic declared the track as the loudest guitar ever heard on a Bee Gees record. On average, Maurice sang lead on one or two songs for each album and he was the lead vocalist on some Bee Gees tracks including "On Time", "Lay It on Me", "Closer Than Close", and his last song "Man in the Middle". His first composition is "All by Myself" recorded in 1966 but not released until 1970 on Inception/Nostalgia. On the Bee Gees' performances of "Nights on Broadway", Maurice sang falsetto on it, rather than Barry who originally sang falsetto on the studio recording. He also showcases his singing career on his unreleased LP The Loner. As a songwriter, Gibb contributed primarily to melody, with his brothers writing the lyrics that they would sing on the finished song (for the most part). It is difficult to identify his contributions because the songs were so shaped to the singer, but his brothers' continued writing collaboration with him on solo projects shows how much they relied on him. He was sometimes known as "the quiet one" for his less obvious contributions to the group, but privately he was a good teller of stories, who immensely enjoyed talking with fans. His reputation as a mild-mannered, stabilising influence with two very ambitious brothers continued through his life. His comic personality shone on stage during Bee Gees concerts when the brothers would perform an acoustic medley. Many times during the song "Holiday", Maurice would mock Robin while he was singing or pretend he was bored (Maurice did not sing on the original record). In 1966, Gibb became a session musician in Australia for other artists including Bip Addison, Anne Shelton, April Bryon, Barrington Davis and singer Jon. Around 1969, Gibb worked with his next-door neighbour, Beatle Ringo Starr, and the result was the track "Modulating Maurice" but it was not released. Gibb played piano on the track "Saved by the Bell" as well as bass on "Mother and Jack" both songs performed by Robin Gibb for his first solo album. Around 1970, Gibb played piano on George Harrison's song "Isn't It a Pity" and Genesis' Phil Collins remembers him being present when he played on that song. In 1971, he produced Lulu's 1971 song "Everybody Clap", which features Gibb on guitar, Leslie Harvey on guitar, former Manfred Mann and Cream member Jack Bruce on bass, and Led Zeppelin's John Bonham on drums. Bonham and his wife, Pat Philips became friends with Gibb and Lulu. Also in that year, he played bass on Billy Lawrie's 1973 song "Freedom". Future Wings and former Thunderclap Newman guitarist Jimmy McCulloch played guitar on that song, and McCulloch suggests that it was recorded at around the same time as Lulu's "Everybody Clap", with Stone the Crows' Maggie Bell providing backing vocals. On 17 January 1972, Gibb produced, with Billy Lawrie, "Baby Come on Home", released as a single also in that year. In April 1972, Gibb produced Jimmy Stevens' album Don't Freak Me Out (called Paid My Dues in US). The same year, Gibb produced Drift Away, an album released by Bob Saker and Mike Berry; it includes a cover version of "On Time". In 1973, Gibb produced and play bass on Jimmy Stevens' unreleased numbers with musicians Alan Kendall, Jimmy McCulloch, Pete Willsher, Zoot Money and singer Paul Jones. In August 1973, Gibb participated on Andy Gibb's first recording session performing two new songs. In 1978, Gibb produced with Steve Klein the Osmonds' album Steppin' Out, features a cover version of Bee Gees' "Rest Your Love on Me". Also in 1978, Gibb composed "The Love That Was Lost", with Blue Weaver on keyboard and arranged by Mike Lewis, who also arranged for the disco group KC and the Sunshine Band. In 1980, Gibb co-wrote with Tim Rice "Last Affair of the Heart", which was recorded by Elaine Paige in AIR Studios in London along with "Secrets" and "Carried Away". In 1982, Gibb took part in Barry's original demo recording of the song "Eyes That See in the Dark", a song intended for Kenny Rogers' album of the same name. In August 1982, Gibb wrote and recorded "Spirit of the Snow" and intended for the film A Christmas Carol. Gibb worked with Robin on his three albums How Old Are You? (1983), Secret Agent (1984) and Walls Have Eyes (1985). Gibb co-wrote "Shine, Shine" with his brother Barry and keyboardist George Bitzer, the song later became a Top 40 for Barry in the US. In 1985, Gibb sang background vocals on Larry Gatlin's songs "Indian Summer", available on Gatlin's album Smile with Gatlin and Roy Orbison on lead vocals; another track "Didn't We Call It (Falling in Love)" was not released. In 1986, Gibb produced Carola's album Runaway. Also in 1986, Gibb participated on the Bunbury songs "Up the Revolution", "Fight (No Matter How Long)", "Bunbury Afternoon" and "Seasons". One of Gibb's last recordings was on the demo of "I Cannot Give You My Love" on which he played keyboards with his brother Barry taking the lead vocals. The song was intended for Cliff Richard. Gibb met Scottish pop singer Lulu through Colin Petersen. Lulu recalls about Maurice, "I thought Maurice was cute, so I said, 'In that case, tell him to stop talking about me and take me out', He did just that, I never expected much to come from this, but in fact our relationship grew, after a fashion. Going steady is quite the wrong way to describe what was happening between us. Going unsteady might better sum up the way we fell in and out with each other". According to Lulu, she, Maurice, and Robert Stigwood watched Pink Floyd at the Saville Theatre in London. Later, after his relationship with Lulu had become public knowledge, he said: "Lulu and I met on the Top of the Pops TV show three months ago, and then at the Saville Theatre in London last month". Later in 1968, Lulu was seen out on the town with Davy Jones of the Monkees; Jones was also a friend of Maurice's. As Gibb recalled, "Davy Jones was a good friend of mine, I broke it off with Lulu over the phone and Davy called me up and said 'I am going to ask Lu to dinner with some friends, is that all right?' I said, 'Yes, I am not going out with her anymore, have a ball' and threw the phone down. They then took so many photos of them and made it look like a six-month romance, but she had only been out with him that one night, she did not even want to go out. She phoned me the next day and she was crying, saying she was sorry". Maurice later regretted not accepting her apology. "We just grew up, that's all," Maurice admitted. "We were miserable apart and when we started going out again, it got so that I didn't want to be with anyone. I used to phone her up from Los Angeles about twice a day. Then she'd call me back. We used to make about 90-minute calls". In the same year, Gibb was seen around town with Hungarian singer Sarolta Zalatnay, but he later insisted: "I'm not a Casanova and it's all most unfortunate. I've never been publicised to be available. Because of the stories of my affairs with Lulu and Sarolta, the fans feel, 'Oh, we won't bother about Maurice because he's always got a steady girl'. Gibb recalled the first meeting with Lulu's parents, his future-in-laws, "I went up to Glasgow to meet Lu's parents, and I was told that Billy, who is younger than Lu, would be at the station to meet me. I got off the train and was walking along the platform when I saw him. I didn't need to speak, I knew it was Billy and I went up to him and said, 'You're Billy, aren't you? ', he said, 'You must be Maurice' and we had met". Maurice and Lulu married on 18 February 1969 and divorced in 1975. Their careers and his heavy drinking forced them apart and they divorced, childless, in 1975. Gibb later said they both drank: "we didn't have any responsibilities, we'd just party." He married his second wife, Yvonne Spenceley Gibb, on 17 October 1975. They had two children, Adam (born 23 February 1976) and Samantha (born 2 July 1980) Gibb, and their marriage lasted until his death. Maurice's alcoholic nadir came in 1991, when he pulled a gun on his wife and children after a month-long bender. They left him and immediately went over to brother Barry's house, refusing to come back until he had done something about his drinking. Maurice went into rehab, calling Yvonne telling her he was going to stay because he really wanted to stop drinking. She said that was the call she had been waiting for. Gibb said he had "battled the booze" since the 1970s. John Lennon introduced him to his favourite drink, scotch and coke: "If he had given me cyanide, I would have drunk the cyanide, I was so in awe of the man." With his neighbour Ringo Starr he would go out drinking. It got to the point where he became unreliable and prior to going onstage would have to feel his way along the wall to get there, according to Barry. One factor in Maurice's recovery was the active intervention of his brothers, who had recently lost their youngest brother Andy. In an interview, Maurice acknowledged that his final years of alcohol abuse had been driven by his failure to reach Andy before his death, and his subsequent guilt. After rehab, Maurice started to rediscover his family again, spending quality time with them. To celebrate this, he and Yvonne renewed their wedding vows in 1992. The ceremony was attended not only by many members of their families but many of the friends Gibb made while at the rehabilitation centre. Maurice would remain sober until his death. Maurice died unexpectedly at the age of 53 at Mount Sinai Medical Center in Miami Beach, Florida, on 12 January 2003, due to complications of a twisted intestine, with his wife, children, and brothers at his side. His funeral service was attended by Michael Jackson, Harry Wayne Casey, Jennifer Valoppi, and Nat Kipner. Valoppi, a family friend said, "It was emotional, there was humor. Everybody talked about how this was a man who really celebrated life and so this was a celebration of his life." Gibb's ex-wife Lulu was reported to have attended his funeral. Kipner, who managed the early Bee Gees career in Australia in 1966 spoke fondly of his memories: "But I had a business in Australia and I didn't want to go. So I gave them their contract back. One of the dumb things I've done," he joked. After his funeral service, his body was cremated. His brothers Barry and Robin ceased performing as a group for a time, but later decided to perform occasionally under the Bee Gees banner before twin brother Robin died of liver and kidney failure on 20 May 2012 after a long battle with colorectal cancer. Barry and Robin Gibb told the BBC about Maurice's death, "The fact that they had to operate on Maurice during the shock of cardiac arrest is questionable." Barry said, "None of the sequence of events have yet made sense to us." Robin Gibb spoke to Mojo magazine about Maurice's death in 2003: "We were kids together, and teenagers. We spent the whole of our lives with each other because of our music. I can't accept that he's dead. I just imagine he's alive somewhere else." Gibb's influences were the Beatles, the Everly Brothers, Cliff Richard, Paul Anka and the Mills Brothers. According to Maurice himself when he was a young kid, he listened to the Beatles' early records. He was also influenced by Paul McCartney's bass guitar playing. Talking about the song "Have You Heard the Word" on which he played bass, "We were just getting ready to do some tracks and we were just doing nothing and I was fartin' around on the bass. I was a big Paul freak. He was a great teacher for me". Gibb continued, "I could play every bass lick he [Paul McCartney] played", especially "Michelle" on which he says "the bass line, really tasteful stuff, and way ahead, way ahead of his time". Jagged Edge and Paul McCartney recorded "Too Much Heaven" in 2004. Wyclef Jean recorded "Jive Talkin'" in 2005 and Sheryl Crow recorded "To Love Somebody" in 2005 as a tribute for him. A tribute to Maurice, entitled Souls Stick Around: A Tale of the Black Hills and Maurice Gibb, was published as an eBook on Amazon.com in March 2012 by Bee Gees fan and author, Dawnette Owens. A recording studio at Chorlton High School, one of the schools the brothers attended, commemorates Gibb. In honouring Gibb, his brother Barry Gibb noted: "Mo was a real McCartney bass freak, as a lot of us were. He would pick up on all the things that McCartney would [do]. Maurice was very good on different instruments, you know. Good lead guitarist, good bass player, good keyboard player. He was versatile. He loved playing bass more than anything else, I think, at that time." Bassist Barry Pethers of the band Trafficker says that Gibb inspired him to play at a time when he was about to throw it all in, "If Maurice had not been so generous my life would be different now. I owe him everything. His warmth and love will stay with me forever". ^ a b c d e f g h Hughes, Andrew. The Bee Gees – Tales of the Brothers Gibb. Retrieved 7 January 2014. ^ "Maurice Gibb Biography". AllMusic. Retrieved 8 September 2012. ^ a b c Brennan, Joseph. "Gibb Songs: 1966". Retrieved 11 January 2014. ^ OMalley, Brendon (11 January 2009). "Bee Gees real Brisbane music pioneers". Courier Mail. Retrieved 16 February 2011. ^ "'Bitter-sweet' trip to palace for Bee Gees". The Daily Telegraph. 28 May 2004. Retrieved 27 September 2014. ^ "The Bee Gees Influences". Shmoop. Retrieved 11 January 2014. ^ "The Story About the Bee Gees / Part 1: 1940–1950". BrothersGibb.org. Retrieved 17 June 2013. ^ Brennan, Joseph. "Gibb Songs:1946–1962". Retrieved 11 January 2014. ^ Brennan, Joseph. "Gibb Songs: 1964". Retrieved 11 January 2014. ^ Brennan, Joseph. "Gibb Songs: 1965". Retrieved 11 January 2013. ^ Brennan, Joseph. "Gibb Songs: 1967". Retrieved 11 January 2014. ^ Eder, Bruce. "Bee Gees – Bee Gees' 1st". AllMusic. Retrieved 11 January 2014. ^ Brennan, Joseph. "Gibb Songs: 1968". Retrieved 11 January 2014. ^ a b Brennan, Joseph. "Gibb Songs: 1969". Retrieved 11 January 2014. ^ "Fake Beatles No. 1: A Blotto Bee Gee and His Pals Around with the Fab Four". WFMU'S BEWARE of the BLOG. 17 January 2008. Retrieved 16 January 2015. ^ Sandoval, Andrew (2012). The Day-By-Day Story, 1945–1972 (Paperback) (1st ed.). Retrofuture Day-By-Day. pp. 102–115. ISBN 978-0-943249-08-7. ^ Brennan, Joseph. "Gibb Songs: 1976". Retrieved 6 February 2015. ^ Brennan, Joseph. "Gibb Songs: 1970". Retrieved 11 January 2014. ^ "The Bloomfields – The Loner". discogs. Retrieved 10 February 2015. ^ Brennan, Joseph. "Gibb Songs: 1981". Retrieved 16 January 2015. ^ "Bee Gees (ultra rare) San Remo festival 1982. Maurice Gibb". Retrieved 21 December 2014 – via YouTube. ^ a b Brennan, Joseph. "Gibb Songs: 1984". Retrieved 18 February 2013. ^ Brennan, Joseph. "Gibb Songs: 1986". Retrieved 18 February 2013. ^ a b Brennan, Joseph. "Gibb Songs: 1985". Retrieved 18 February 2013. ^ "Maurice Gibb dies after stomach op". BBC News. 12 January 2003. Retrieved 8 February 2015. ^ DjukiNew1957 (2 July 2015). "You win again – Bee Gees (Live 1988)" – via YouTube. ^ WebTwinkle (23 March 2012). "BEE GEES For Whom The Bell Tolls -New York-" – via YouTube. ^ NEA ZIXNH (15 March 2014). "Bee Gees – Stayin' Alive 1989 Live Video" – via YouTube. ^ Eder, Bruce. "2 Years On – Bee Gees". AllMusic. Retrieved 10 February 2015. ^ "Bee Gees Nights on Broadway 1975". Retrieved 8 February 2015 – via YouTube. ^ Melinda, Bilyeu, Hector Cook, Andrew Mon Hughes, The Bee Gees / Tales of the Brothers Gibb. London: Omnibus, 2001. ^ Kutner, Jon. 1000 UK Number One Hits. Retrieved 14 February 2015. ^ "Special Merit Spotlight". Billboard: 50. 22 May 1971. Retrieved 14 February 2015. ^ Hoskyns, Barney. Led Zeppelin: The Oral History of the World's Greatest Rock Band. Retrieved 14 February 2015. ^ Brennan, Joseph. "Gibb Songs: 1971". Retrieved 18 February 2013. ^ Brennan, Joseph. "Gibb Songs: 1972". Retrieved 18 February 2013. ^ Brennan, Joseph. "Gibb Songs: 1973". Retrieved 18 February 2013. ^ Brennan, Joseph. "Gibb Songs: 1978". Retrieved 18 February 2013. ^ Brennan, Joseph. "Gibb Songs: 1980". Retrieved 18 February 2013. ^ Rust, Victor. The Cliff Richard Recording Catalogue 1958–2010. Retrieved 14 February 2015. ^ Marion Adriaensen (25 November 1966). "History Part 4". Brothersgibb.org. Retrieved 27 June 2013. ^ "Maurice Gibb – Obituaries, News". The Independent. Retrieved 5 September 2011. ^ a b c d e f Woman's Day Australia, 3 October 1992. "Maurice Gibb: Demon Drink", page 8. ^ "Interview With the Bee Gees". CNN. 2 February 2002. Retrieved 11 January 2013. ^ Lawrence, Ken. John Lennon: In His Own Words. Retrieved 14 February 2015. ^ CandiottI, Susan (16 January 2003). "Gibb autopsy cites twisted intestine". CNN. Retrieved 22 December 2010. ^ a b "Hundreds Attend Maurice Gibb's Funeral". Billboard. 16 January 2003. Retrieved 18 February 2015. ^ "Private funeral for Maurice Gibb". BBC News. 15 January 2003. Retrieved 18 February 2015. ^ D'Angelo, Joe. "Bee Gees Name To Be Retired, Robin Gibb Says". MTV. Retrieved 10 December 2009. ^ Michaels, Sean (8 September 2009). "Bee Gees to re-form for live comeback". The Guardian. London. Retrieved 12 May 2010. ^ "Gibb died from kidney, liver failure". Toronto Sun. Retrieved 27 May 2012. ^ "Bee Gees raise questions over death of Maurice". Daily Mail. Retrieved 18 February 2013. ^ "Robin Gibb, 1949–2012". Mojo. Archived from the original on 27 May 2012. Retrieved 18 February 2013. ^ a b Melinda Bilyeu; Hector Cook; Andrew Môn Hughes. The Bee Gees. Retrieved 6 December 2014. ^ Joseph Brennan. "Gibb Songs: 2004". ^ Joseph Brennan. "Gibb Songs: 2005". ^ "Bee Gees go back to their roots". BBC News. 12 May 2004. Retrieved 8 March 2013. ^ Sandoval, Andrew. "Bee Gees – Idea at Album Liner Notes". Album Liner Notes. Retrieved 21 May 2013. ^ Pethers, John. "Barry Pethers' Memories "Stayin' Alive"". Rickenbacker Resource. Retrieved 18 February 2015. ^ a b "Hits of the World". Billboard: 64. 3 October 1970. Retrieved 14 February 2015. Wikimedia Commons has media related to Maurice Gibb. "Hold Her in Your Hand"